What are formulas and how can they help me? For a numeric question, a formula can be used to calculate the answer based on other answers. One could for example calculate the volume based on height, width & length using the formula $length * $width * $height. 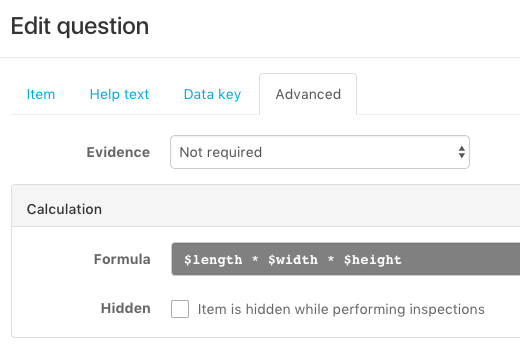 Note: The question values (length, width, height) are retrieved using their data keys. So data values should be enabled for both your organization (contact Support if needed) and the template itself. When preferred the calculated question can be hidden so that the user won't see the output while performing the inspection. $prefix refer to a list of values. If you have 5 questions with data keys item_1, item_2, item_3, item_4 and item_5 with values 1, 2, 3, 4 and 5, the expression $item will result in a list of all answers given to those questions.